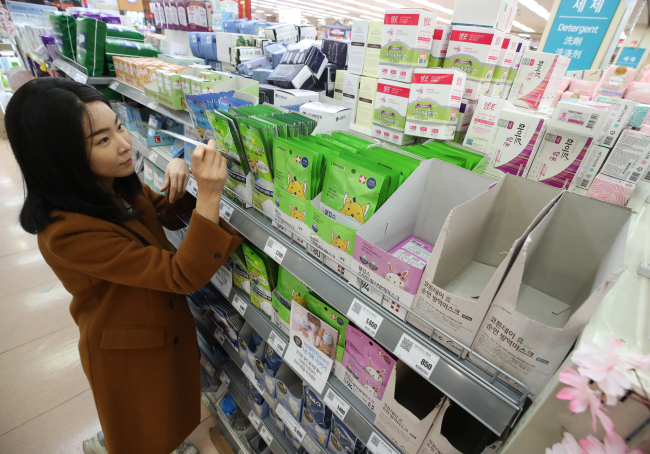 With prolonged nationwide warnings on high fine dust levels, household and health care products to combat it saw a steep rise in sales, industry data showed Wednesday. The South Korean authorities on Tuesday enforced emergency measures for the sixth consecutive day in Seoul, Incheon and Gyeonggi and the North and South Chungcheong provinces. According to eBay, its domestic e-commerce websites G-Market, Auction and G9 saw up to sevenfold jump in sales of products designed to filter fine dust from Thursday to Monday this week, compared to the previous week. Sales of fine dust filters that can be attached to windows skyrocketed 300 percent, while those of masks rose by 256 percent. Oxygen generators, similar to air purifiers which generate fresh air, saw 238 percent increase in sales. Sales of air purifiers for vehicles also rose 188 percent, while hand soap and houseplants known to filter indoor air -- such as Sansevieria stuckyi and parlor palm -- saw sales rise 25 percent and 26 percent, respectively. Products related to eye care such as contact lens sterilizers also saw an increase of 135 percent, while appliances such as steam closets saw sales rise 89 percent.